Twenty-five years ago, Samuel Huntington’s lecture, ‘The Clash of Civilizations?’, popularised a view of conflicts between ‘civilizations’, mostly based on ‘religion’ (loosely interpreted). Mass media have been central to the emergence and dissemination of what rapidly became known as the ‘Huntington thesis’. For example, Edward Said in his essay on ‘The Myth of the Clash of Civilizations’ observed that “Journalism and poplar demagoguery are [Huntington’s] main sources, rather than serious scholarship or theory,” tending to “prejudice the argument in favour of conflict and polemic”. Media are also regularly accused of fostering polarised public conversations, insulating citizens within ideological ‘bubbles’, and even playing to prejudice by disseminating ‘fake news’. However, journalists also have a historic role as sources of critique, resistance and dissent, and of impartial commentary and factual information. A panel of foremost Australian social and media commentators looks at the role the media have played in reinforcing, and challenging, divisive rhetoric in Australia and beyond, especially between European and non-European cultures and religions. The panellists question the dominant characterisation of clashes as religious or cultural, obscuring other motives which might be in play, especially the competition for economic resources. This session will be chaired by Professor Marion Maddox FAHA (Macquarie University) in discussion with Dr Shakira Hussein (University of Melbourne), Dr Randa Abdel-Fattah (Macquarie University), Rory O’Connor (Yugambeh Museum), photojournalist Steve Levitt and Noel Debien (ABC Radio National). The term ‘culture wars’ has been a rhetorical device for explaining divisions between various groups in Australia and the world for the past 50 years. Oppositions like Western /Eastern, religious/secular, Christian/Muslim, invader/indigenous, even right/left have all been useful to those who have sought to promote social disunity. This panel reviews the evolution of wider debate about such oppositions from a range of perspectives, both methodological and regional. Thus it looks at the spatial and cultural imaginaries evoked by this rhetoric through the lens of Arab writers, operating in a transnational framework. What are the alternative perspectives about conflicting cultures in the Middle East, occluded by official government policies that we need to hear? Culture wars are invoked to describe conflicting perspectives within Australia, between Indigenous and non-Indigenous groups. How might they evolve in the future? Culture wars are also invoked within Europe as anxieties increase about refugees, migrants and the future of liberal democracies. Are there new ways of considering how globalisation is impinging on debates that speak only in terms of the nation state? Professor Mark McKenna FAHA, University of Sydney—‘The View from the Ship’ or the ‘View from the Shore’? Clashes between religions and cultures of the past have real implications for today’s attempts to defend territorial rights, freedom of religion and freedom of movement or, in some cases, to destroy these rights. 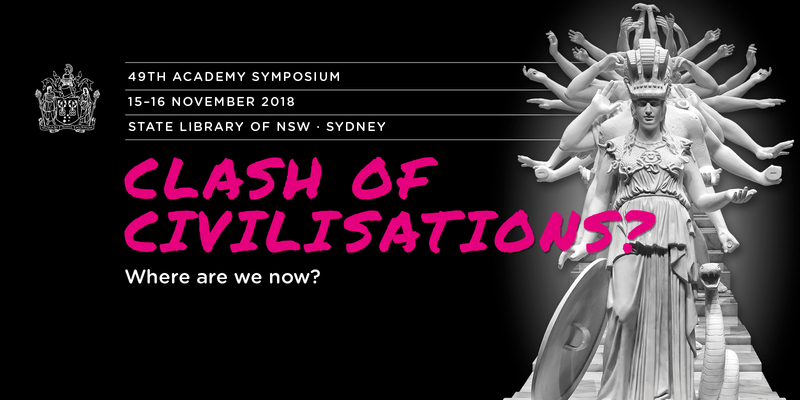 The speakers will consider the clashes between ancient cultures and new arrivals: pagans with Christians in classical Greco-Roman society, indigenous Australians with European settlers, and Christians with Muslims in ancient Syria, and the impact of these clashes on social cohesion in those areas today. Every year the Academy invites a Fellow to deliver the annual Academy Lecture. Since 1970, this tradition has demonstrated the extraordinary breadth and depth of our Fellows’ contribution to the Australian and international humanities community, and to enriching the cultural life of the nation. The 49th Academy Lecture—Turning the Level of Civilisation Up: The Twenty-first century challenge—will be presented by Honorary Fellow Professor Julianne Schultz AM FAHA, Professor of Media and Culture at Griffith University’s Centre for Social and Cultural Research, Publisher and Founding Editor of Griffith Review. Hosted by Macquarie University’s Vice-Chancellor and President, Professor S. Bruce Dowton. The politics of identity, whether ethnic, cultural, religious, or racial, has been a major driver of complexity in multi-cultural Australian development over the course of its history. We define ‘identity’ as the major criterion for a sense of belonging. This panel presents case-studies of contemporary identity politics in Australia, France and China. All three speakers place an emphasis on the historical diversity of experiences. The first two concentrate on the evolving relationship between religion and state, and how that effects national identities. Roland Boer looks at the multi-religious reality of contemporary China and the new dimensions that this can add to European definitions of religious freedom. Marion Maddox examines how religious identity impacts on concepts of citizenship in the Australian and French schooling systems. Our third speaker, Bronwyn Carlson, brings an Indigenous perspective to her discussion of contested authenticity in relation to questions of Aboriginal identity. These presentations demonstrate not only that Western civilization and its values have ceased to be regarded as ‘universal’ but that hybrid global identities are emerging in many societies, to the enrichment of some of their citizens and the impoverishment of others. Professor Bronwyn Carlson, Macquarie University—The Politics of Identity: Who counts as Aboriginal in contemporary Australia? This session explores the ways in which human collaboration and conflict is enacted and expressed through languages and the arts. We begin by engaging with the linguistic medium through which we debate civilization. English sets the terms of the debate in particular ways as the word “civilisation” lacks translation equivalents in many languages. The dominance of English not only affects how we think about intercultural communication but has also shaped actual inter-group engagement in Australia since colonisation. In the dominant narratives of the relationship between Europeans and Indigenous people, colonial violence and subjugation has often been erased and replaced with a relatively benign civilising narrative. One such civilising narrative is that of an indigenous boy “rescued” – rather than, say, “stolen” – from his family. Global linguistic diversity too has consequences for inter-group relationships. An overview of recent research into the role of linguistic differences in various war and conflict situations in Asia and Europe is followed by a case-study of the ways in which cross-cultural encounters are enacted and represented in performance art. Via Italian popular theatre, the final presentation takes us back to ceremonial performances of intercultural engagement in Australia. Professor Cliff Goddard FAHA, Griffith University—“Civilisation” and other meta-categories: How they work and how to do without them. This lecture series invites young Australian scholars of excellence to talk about their work with a broader audience. The lecture series is made possible through a bequest from the estate of Sir (William) Keith Hancock KBE FAHA and is usually delivered every three to four years. The 8th Hancock Lecture—Hybrid civilisations or Clash of civilisations? : Re-visiting the Muslim Other—will be given by early career Arab and Islamic Studies scholar, Dr Raihan Ismail from the Australian National University. ‘European Thousand-Armed Classical Sculpture’ by Xu Zhen (MadeIn), 2014. Appears courtesy of the artist and White Rabbit Gallery, Sydney.